Check out the Digitours of the D3 and the D300. Vista Codex updates for the D3 and D300 RAW format. 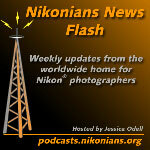 The Nikonians were in full-force at the Nikon Solutions Expos in London and Cologne! Don't miss our new podcast : Turning Pro! The Eye-Fi comes highly recommended! Get accredited by the Sports Photographers Association of America! I dream of Jeannie, no, lenses..
Who wears photographers' vests these days?. December's Online Photo Assignment: Specular Highlights.